Going on road trips to observe the beauty of fall foliage across the USA is now a common travel goal. Try taking the scenic train rides that brings the whole family together while soaking up in the surreal landscapes. All you will need is some snacks, good sense of adventure and sit in comfort. Here are the best fall train rides in the US you must not miss this year. It is one of the best scenic train rides in USA that serves ideal to soak in the season’s colors. It is a 26 mile splendid round trip excursion taking you on a 4-hour journey across River Roccoa in the Chattahoochee National Forest. Just sit back in the perfect vintage car and allure the surreal views. To make it more memorable, get a layover at George-Tennessee border in McCaysville town. After seeing the fall foliage around the towns of George, Copperhill and Tennessee; spend the afternoon shopping for antiques and have delicious lunch at the quaint cafes out there. Either go on a full day or half-day trip boarding the Cumbres and Toltec Scenic Railroad – a steam engine traveling along the Colorado-New Mexico border. You will love the National Historic Landmark, the steam engine running on coal and moving 64 miles across the elevations of almost 10,000 feet, soak in the mesmerizing sight of historic buildings and the 800ft tall gorge. You can also spot bears, elks and deer on the journey. Don’t worry about getting to the United States, you can even get last minute flights at affordable rates now. Just make a plan anytime during fall. Vermont is among the places showcasing splendid views of fall foliage in the United States and not only this; it offers one of the memorable train trips as well. The Green Mountain Railroad is a 2 hours round trip in Chester, Vermont. This exceptionally scenic train ride will fill you and your family with immense joy and pleasure. Booking a four-course dining experience in the train will serve as a cherry on the cake. You can also take a halt at Okemo Mountain Resort, especially when traveling with your partner. 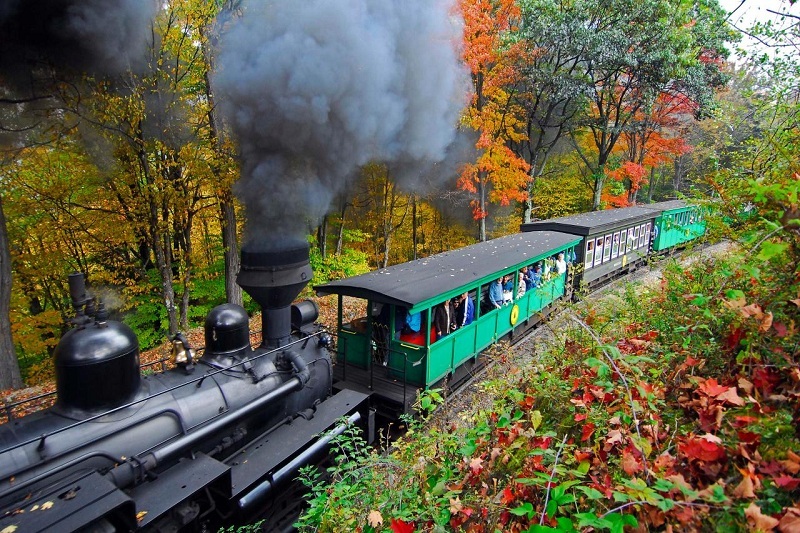 Board the Cuyahoga Valley Scenic Railroad from Peninsula and experience the best fall foliage train rides in the USA. The views of sugar maples, dogwood trees and the breathtaking landscape turning up to different shades of orange, red and yellow. It is a 3.5-hours train journey passing the Cuyahoga Valley National Park. If you enjoy eating while alluring the scenic views, book the dining experience in the train and also enjoy different ongoing events such as beer tasting, sip rides, paint rides and Halloween costume trains. Running from Anchorage to Fairbanks, a fall r ide on Alaska Railroad Denali Star Train is like a dream come true. This name has to be on the bucket list of travelers seeking a fall ride excursion in Alaska. On this long yet soothing 12 hour journey, you will come across the spectacular views of colorful foliage and if you are God’s lucky child, a glimpse of the northern lights and Denali is also not impossible. Have booked business class flights for the important meeting in Alaska? Hop on this train with your colleagues to get the feel of fall and relax your mind and body. You can’t stop admiring the phenomenal views from Mount Washington, the 6,288 high summit on the while traveling on the Mount Washington Cog Railway. Running for more than 144 years, the railway is among the best scenic train rides across the country. It is a 3-hour rail excursion offering you a chance to have a glimpse of five states, the Atlantic Ocean and Canada. Post the fall foliage ride, go to the summit to explore and capture views at the observatory of visitor center and browse through the weather museum, all at the summit. Situated 60miles towards the east of Portland, this train trip is worth boarding for the indescribable beauty of fall foliage on route. The Mount Hood Railroad in River Hood is a 22 mile train excursion taking you through a kaleidoscope of different colors on the Oregon’s foliage surrounding the snow-covered Mount Hood. Engulfed in Columbia River Gorge, River Hood is no less than a spectacular place to observe the best fall foliage in the region of Pacific Northwest.